QCC files can have multiple sources. Most commonly a part is measured on a CMM or Vision machine for some of its features and is then finished with a handheld gage. Maybe you have to measure the part on multiple machines. Either way, you can have multiple sources of data about the same part being send to the same database. To match up the parts we provide 7 difference options from the simplest (measure order) to more complex ways such as a unique identifier. To take an example, let's say you have a part with 10 features and want to measure the first 8 on a CMM with the last 2 coming from a pair of calipers. Simply measure the part on the CMM. Then start up a spec plan in QC-Gage and measure the last two features. Depending on the method you chose for merging, the last 2 features will be added to the same part in the original QCC file. Need to remeasure a part? If you are using a unique identifier, simply remeasure the part on the machine or gage. 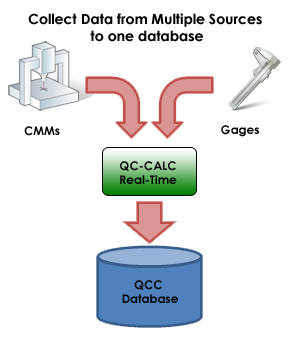 When it gets to QC-CALC Real-Time, Real-Time will automatically replace any existing measurements with the new values. Since the data for the part is now coming from multiple sources, it's harder to tell when you want to trigger your reports and exports. To solve this, we've added options to allow you to tell us whether you want to trigger reports/exports immediately or after a full part has been collected.